Eye color is much more complicated than is usually taught in high school (or presented in The Tech’s eye color calculator). 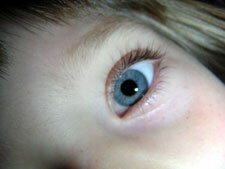 There we learn that two genes influence eye color. One gene comes in two versions, brown (B) and blue (b). The other gene comes in green (G) and blue (b). All eye color and inheritance was thought to be explained by this simple model. Except of course for the fact that it is obviously incomplete. The model cannot, for example, explain how blue eyed parents can have a brown eyed child. Yet this can and does happen (although it isn’t common). New research shows that the first gene is actually two separate genes, OCA2 and HERC2. In other words, there are two ways to end up with blue eyes. Normally this wouldn’t be enough to explain how blue eyed parents can have a brown eyed child. Because of how eye color works (see below), if one gene can cause brown eyes, it would dominate over another that causes blue. In fact, that is what happens with green eyes in the older model. The brown gene dominates over the green one resulting in brown eyes. The key is that if someone makes a lot of pigment in the front part of their eye, they have brown eyes. And if they make none there, they have blue. Part of the pigment making process involves OCA2 and HERC2. A working HERC2 is needed to turn on OCA2 and OCA2 helps to actually get the pigment made. They need each other to make pigment. So someone with only broken HERC2 genes will have blue eyes no matter what OCA2 says. This is because the working OCA2 can't be turned on so no pigment gets made. And the opposite is true as well. Someone with broken OCA2 genes will have blue eyes no matter what the HERC2 genes are. Turning on a broken pigment making gene still gives you no pigment. You need a working HERC2 and a working OCA2 to have brown eyes. Because the two genes depend on each other, it is possible for someone to actually be a carrier of a dominant trait like brown eyes. And if two blue eyed parents are carriers, then they can have a brown eyed child. Genetics is so much fun! So all you light eyed parents with dark eyed kids, stop asking those paternity questions (unless you have other reasons to be suspicious). Darker eyed kids are a real possibility that can now be explained with real genes. These two facts provide one explanation for how blue eyed parents can have a brown eyed child. To understand how, a little genetics refresher course is in order. People have two copies of most of their genes. They get one copy from mom and one copy from dad. These genes can come in different versions (or alleles). For the sake of this discussion, we will say that OCA2 comes in brown (O) and blue (o) versions. Reality is actually a bit more complicated and this will be dealt with in the second article of this series. Looking at the table, it quickly becomes obvious that any time there are two lower case h’s or two lower case o’s, a person has blue eyes. As will be discussed in the next section, this is because HERC2 and OCA2 need each other to have an effect and the blue versions of each gene are broken. Each child has a 25% chance of having brown eyes and a 75% chance of having blue eyes. This is simplified since the other eye color genes (like those that influence green eyes) are being ignored. But it does mean that brown (or green or hazel or…) eyes are a definite possibility for these blue eyed parents. Also note that the child in the lower right hand corner no longer carries a brown eye gene. They will not have a brown eyed child as easily as their parents! Again this is understandably a bit confusing since these parents are technically carrying a dominant brown trait. To understand this, we need to get into the nitty gritty of how eye color and these two genes work. She could be carrying a brown eye gene! OCA2 is one of the key genes in determining how much pigment gets made. So it makes sense that if both OCA2 copies are broken, someone would have blue eyes. Because they can’t make a lot of pigment. Most of the HERC2 gene has very little to do with eye color. There is one small section in the middle, though, that controls whether OCA2 is turned on or not. If this part of HERC2 ends up broken in both copies, then OCA2 can’t get turned on. And if OCA2 is off, no pigment gets made. It is like the OCA2 gene is broken. Think about OCA2 like a light bulb and HERC2 as a switch. If the light bulb is burned out, it doesn’t matter if the switch is turned on. Just like it doesn’t matter if HERC2 works in someone with broken OCA2. Flipping the switch to a burned out bulb won’t give you any light! Same thing with a working OCA2 and a broken HERC2. A working light bulb gives no light when the switch is off. And a working OCA2 makes no pigment when the HERC2 gene is broken. This is what happens when blue eyed parents carry a brown eye gene. If they have blue eyes because of a broken HERC2, then they might still have an OCA2 that works. And if they have a broken OCA2, they might have a working HERC2. When these two have kids, one might pass an on switch and the other a working light bulb. Now there is light even though neither parent could make light before. Or in genetic terms, one might pass a working HERC2 and the other a working OCA2. Now there is pigment where there wasn't any before. The end result is brown eyes. This light bulb/switch relationship is called epistasis in genetics. This is simply a fancy way of saying that one gene depends on the other. And that if one breaks down, both will no longer have an effect. So now science can finally explain one mystery of eye color. Or at least propose one of the ways blue eyed parents can have brown eyed kids. The next article will deal with eye colors other than the big three. And talk a bit about why some hair colors tend to have certain eye colors. An interesting twist to this puzzle is the fact that HERC2 and OCA2 are so close together on chromosome 15. What this means is that versions tend to travel together. And this affects the combinations of kids that any two parents can actually have. The results are a 9 in 16 chance for brown and a 7 in 16 chance for blue. This assumes that any of four combinations of the two genes is possible. This is true for genes that are far apart or on different chromosomes. This does not tend to be true if genes are really close together like OCA2 and HERC2. Now blue is less likely. And all the blue eyed kids wouldn’t be carrying a brown eyed gene anymore! And if the alleles were arranged differently, you’d get different odds.